Welcome to NETWORK’s 40 days of Lent, “A Time to Pray, A Time to Act.” As I was reflecting on this time, I thought of two scriptural references. The first was Jesus’ withdrawal to the desert for 40 days before he began his public ministry. In this very challenging political time I believe that we need to engage in a intense spiritual practice of listening to the Spirit in our midst so that the new might emerge. I know that we cannot do “business as usual.” But it is less clear to me what the new approaches to this political chaos should be. Let us pray and listen together to the Spirit in these 40 days ahead. The second scripture that I thought of was the story of the Exodus. In the Exodus the Jewish people wandered for 40 years sometimes with a cloud by day and a pillar of fire by night. Now we only have 40 days and not 40 years, but I realized the other day that each day feels a bit like a year. We wander without a strong sense of how we as a nation are a community. We complain about “Why can’t it be like it was?” In short we are lost and reliant on God’s generosity to see us through. So welcome to a Lent of prayer and action: listening to the Spirit and calling Congress. This is what will create the common good. May we be faithful in the journey. 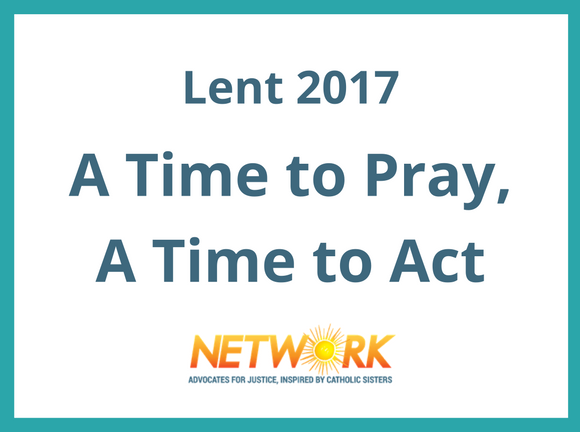 Sign up for NETWORK’s Lent emails. This entry was posted in Front Page, Sister Spirit on March 1, 2017 by networklobby.